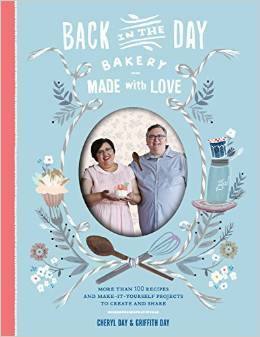 I have in my hands an advance copy of Back in the Day Bakery: Made with Love by Cheryl and Griffith Day. Or, really, I've got an eBook on my reader device. Since it's an early review copy of the book, I can't share a recipe or quote anything, since text might change before final publication, but I can give you my impressions of the book. I think the best way I can describe it is to compare it to the first book The Back in the Day Bakery Cookbook that I wrote about on Cookistry. That first book had good, solid recipes that were more fundamental than flashy. I've made a few of those recipes and bookmarked a whole lot more for later. The recipes in this new book look just as solidly constructed, but they're a little less standard, like the chocolate bubble loaf, sweet potato has hand pies, Mexican spice cake with chocolate glaze, clementine pound cake with chocolate honey glaze, double chocolate mint chess pie, and key lime shortbread cookies. Of course, there are standards as well, like angelfood cake, old fashioned buttermilk biscuits, sugar cookies, pineapple upside-down cake, and spoon bread. It's a good mix of the usual and the unusual. And, as one would expect in cookbooks these days, the photos are lovely. Besides recipes there are also a few food-related craft projects. I'm very unlikely to attempt those, but they're amusing. And the recipes aren't all baking - there are jams and spreads deviled eggs, pickles, syrups, and sauces as well. While the less-usual recipes aren't just your basic chocolate and vanilla, they also won't leave you scrambling to find ingredients that don't exist at normal grocery stores. Some are seasonal, but all are very doable. Overall, I like this book as much as the original, and when it's published (March, 2015), I'll probably pick up a hard copy, since I prefer solid books over the digital kind. I was provided with a digital copy of the book at not cost to me for the purpose of a review.